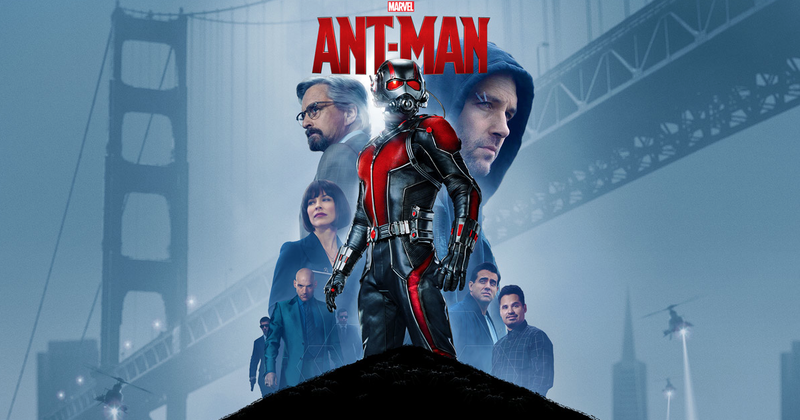 Off-beat Marvel heist movie featuring an unusual “ant-y” hero seeking to protect the world from the very technology that gives him his power, starring Paul Rudd, Michael Douglas and Evangeline Lilly. I’ve never been much of a Marvel fan. I didn’t like the comics as a kid, found most of the early movies rather cheesy and always preferred the darker, more psychological realism of Batman and Gotham city to the gaudy technicolour world of Stan Lee’s creations. Watchmen is actually my favourite graphic novel, but The Dark Knight Returns isn’t far behind ..
That said, some of the more mature recent offerings from Marvel Studios have been very effective action movies, featuring real plots and proper character development. The Iron Man and Avengers series in particular have proven to be genuinely entertaining, witty pictures that not only helped re-establish the comic book movie in general, but also the career – and possibly the life – of Robert Downey Jr. If ever a man was put on this planet to look smug and deliver lines with tongue firmly in cheek, it’s Bobby D.
Fair play to the guy – you couldn’t imagine anyone else in the role, could you ? However, they also churn out pap like Guardians Of The Galaxy, which for the life of me I could not get into, and I saw it in a packed cinema in the first week of its release. I can only imagine it’s to hook younger kids into the genre and – presumably – to shift “merchandise” in the form of toys, games and the inevitable plastic lunchboxes. The endless reboots of Spiderman and the Fantastic Four are annoying, too – but then Superman and Batman haven’t exactly had stable representations down the years, either .. So which category would you expect Ant-Man to fall into ? Predictably laboured genre fodder aimed at the masses or sharply satirical black comedy that actually sends up the Marvel universe itself ? With zero expectations and an open mind, I sat down expecting the former but left the auditorium pleased to have experienced a big fat wodge of the latter. The story centres on cat burglar and electronics ace, Scott Lang, played with just the right level of comedic chops and arrogance by Hollywood’s go-to “nice guy”, Paul Rudd, who you may know from supporting roles in Clueless and Anchorman. He’s out of prison, determined to clean up his life and go straight for his daughter’s sake, if not his own: she sees him as a hero, despite having a cop for a step-dad. With his hopes and dreams hanging in the balance after being sacked from a dead-end job when they found out he’s an ex-con, he contemplates one last robbery to set himself up financially when he finds himself embroiled in a power struggle of a different kind between two heavyweight technology experts. Michael Douglas is in good form as Hank Pym, the creator of the original shrinking device, forced out of his own company by his ruthless protege who has developed his own version of the Ant-Man exosuit and is looking to sell to the highest bidder. 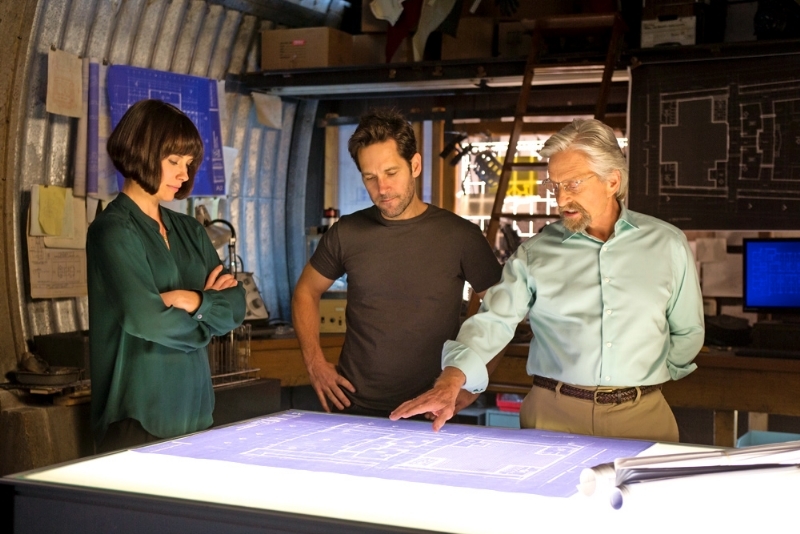 Knowing what this might mean for world peace, Pym enlists the help of the reluctant Lang, training him for the task ahead with the aid of his daughter, Hope, played by Lost’s Evangeline Lilly. Herself hell-bent on vengeance for what happened to her dad, Hope wants to do the job instead of getting some stranger involved and happens to be a martial arts expert. So far, so Marvel, huh ? Well, yes and no … this is like a Marvel movie made by someone else, like Guy Ritchie or even the Coen Brothers, in that it has all the classic elements of a superhero flick, but there’s a whole new layer on top that makes it that much more interesting and – dare I say it – intelligent at the same time. There’s loads of dodgy tech and scientific lingo, a classic revenge motive, an uncertain everyman hero, a gorgeous female, a lovely old man and a strong possibility that the world is about to end. But there’s also lots of in-jokes about Stark Industries, more gags than all the X-Men, Avengers and Iron-Man series put together and there’s also the ants themselves, which I haven’t even mentioned yet. 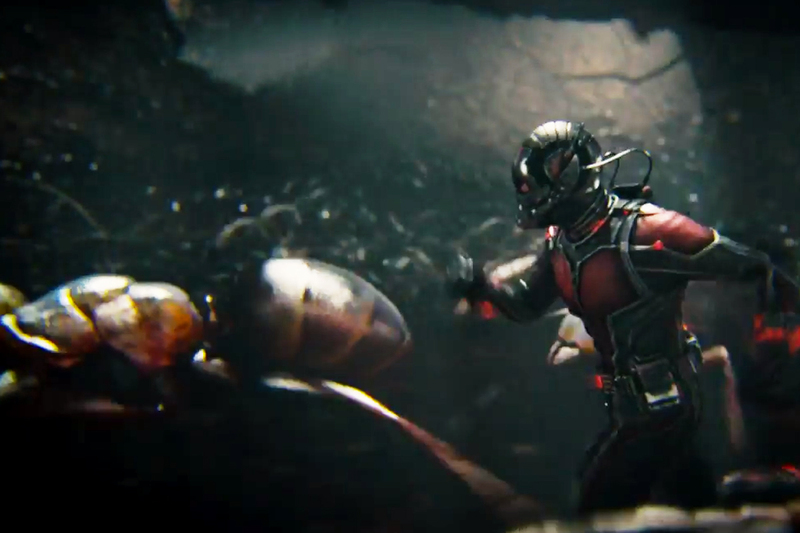 Ant-Man isn’t just their size: he can also summon them and control them to help him. It’s like an army of biological nano-bots you direct by thought alone, all with the help of Michael Douglas’ hearing-aid .. or something that looks just like it. This is one of those rare movies that are better seen blind than being told about, or reading a review or having watched the trailer. The latter, especially, makes it look like a spoof, like a kid’s film .. or, worse still, like a living cartoon. It’s none of those things: it’s an above-average action picture that also happens to be really funny. 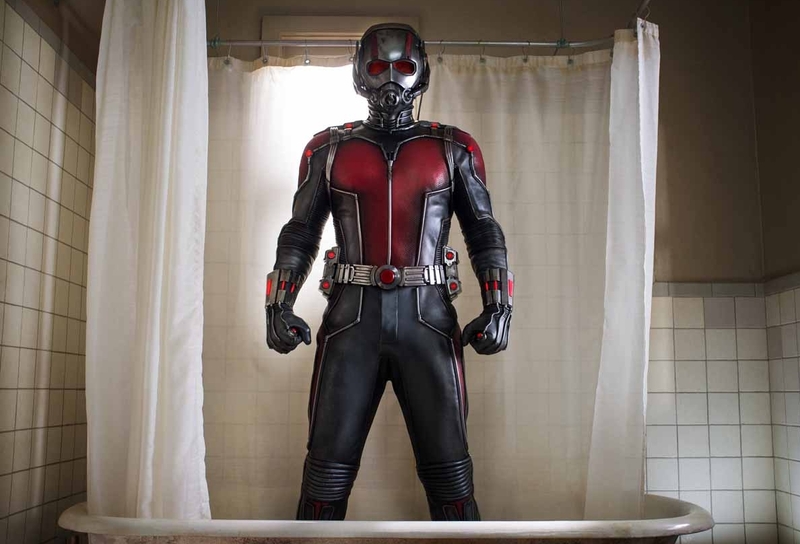 I’m happy to say Ant-Man will be back, too .. I have big hopes for this small superhero.